Thimble Shoal – Chesapeake Chapter U.S.L.H.S. 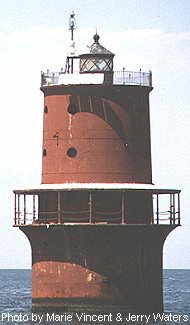 The first Thimble Shoal Lighthouse was a six-sided screwpile light erected in 1872. This light was first lit on October 15, 1872. This light replaced the last lightship in the bay. The light was listed as 3 ½ miles east of Old Point Comfort at Willoughby’s Spit and The Thimble entrance to Hampton Roads. On October 30, 1880, a fire destroyed the wooden lighthouse leaving only the iron work and other un-burnable items. The Lazaretto depot in Baltimore just happened to have another screwpile light ready to be delivered to Bell’s Rock, Virginia. This light was sent to Thimble Shoal instead to replace the light that had burned. This new light was lit for the first time on December 24, 1880. In March 1891 the screwpile was rammed by a steamer and damaged. Then again in 1898 it was rammed by a coal barge. This time there was considerable damage and extensive rebuilding was required. In December of 1909 the hexagonal cottage was completely destroyed by fire and the pile foundation destroyed when it was rammed by the schooner Malcom Baxter, Jr.. This ship in tow hit the light so hard that it over turned the coal stove and the resultant fire completely destroyed the light. The two keepers were able to escape in their small boat and survived the snow and gale force winds that night on the bay. Congress appropriated funds for a new lighthouse at this site in 1910, but this new caisson structure was not ready to be installed until 1914. It is three stories tall and stands 55 feet above the water. When it was first lit, the light had a fourth-order Fresnel lens that had a clockworks that rotated an eclipser that flashed the light one for one second and off for one second. In 1964 this light was automated with the instillation of a power cable from shore with a battery back-up. In 1987 the electric cable was replaced by solar cells. In 1988 the Coast Guard performed extensive restoration work the light including a new coat of paint. This light is the last to still have its’ canopy over the first level. This is another light that you need a boat to see up close. The best was to see it from land is to visit Old Point Comfort at Fort Monroe, VA (See the driving directions for this light) and look east and slightly north and the light is about three and a half miles off shore.